For this project, you want the images to be identical sizes and for each to be surrounded by a narrow white border. 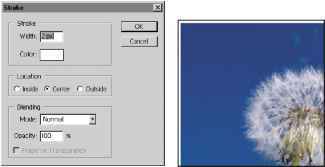 You're now ready to perform those tasks on the dandelion image, which you'll do by setting the image dimensions to a specific number of pixels and by setting a stroke and stroke properties that will surround the image. As you work, you'll set the Actions palette to record each step of the process. Note: It is important that you finish all the steps in this procedure without interruption. If you become distracted and need to start over, skip ahead to step 9 to stop the recording. Then you can delete the action by dragging it into the Delete button ( ) in the Actions palette, and start again at step 1. 1 In the Actions palette, click the New Action button (j) or choose New Action on the Actions palette menu. 2 In the New Action dialog box, type Size & Stroke in the Name option and make sure that My Actions is selected in the Set pop-up menu. Then click Record. Note: Take all the time you need to do this procedure accurately. The speed at which you work has no influence on the amount of time required to play a recorded action. 3 Choose Image > Image Size. 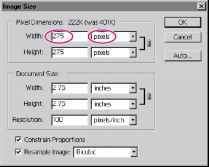 4 Make sure that both the Constrain Proportions and the Resample Image check boxes are selected at the bottom of the Image Size dialog box. Then, for the Width, type 275 and make sure that pixels is selected as the unit of measurement. Then click OK.
5 Choose Select > All. 6 Choose Edit > Stroke. • In the Width option, leave the value at 1 pixel. • In the Color swatch, use white, or select it by clicking the swatch to open the color picker, selecting white (C, M, Y, and K = 0), and clicking OK to close the color picker. • Under Location, leave Center selected. 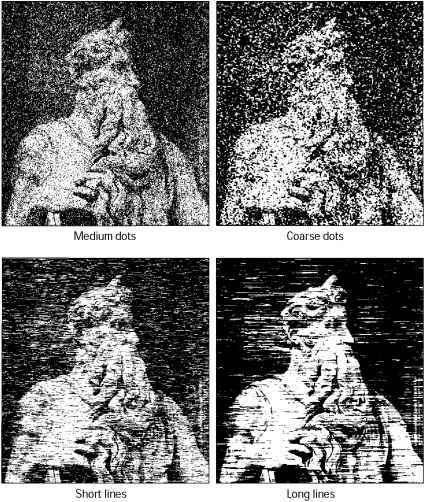 • Under Blending, leave Mode set to Normal and Opacity set at 100%. • Then click OK to close the Stroke dialog box. 8 Choose Select > Deselect. 9 In the Actions palette, click the green Stop button (_i) at the bottom of the palette to stop recording steps. Save your work. Your action is now saved in the Actions palette. You can click the arrows to the left of the My Actions set, the Size & Stroke action, and beside each step of that action to expand and collapse them at your convenience. With these expanded, you can examine each recorded step and the specific selections you made. When you finish reviewing the action, click the arrows to collapse the steps.